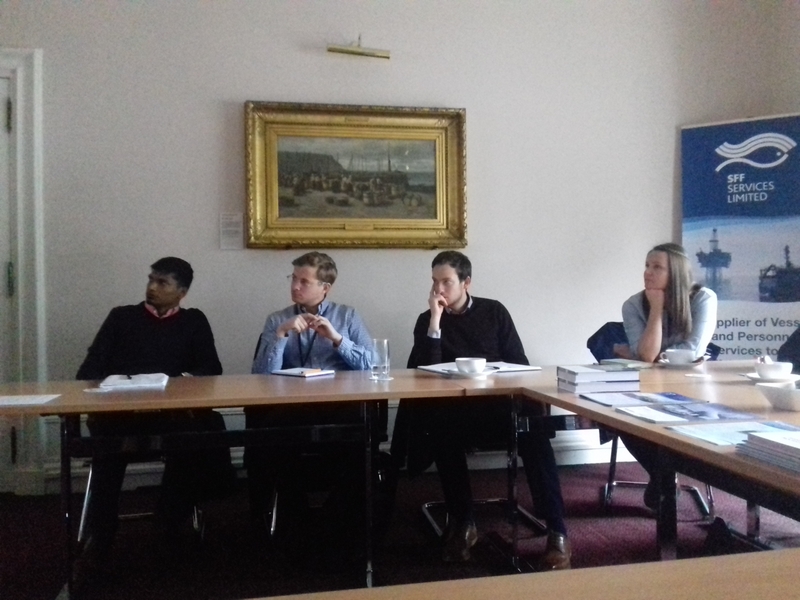 BP Environmental Advisors attended a Fishing Industry Awareness Seminar at the SFF Services office this morning for an informative and productive session, with some great questions from the BP delegates. Presented by SFF Services Managing Director Steven Alexander, and Industry Advisor Raymond Hall, this seminar provides delegates with an opportunity to find out more about the Fishing Industry. Fishing Industry knowledge is invaluable for oil and gas project teams, leading to improved planning and management of subsea operations, and the presentation covers a range of topics from types of fishing gear, vessel sizes and bollard pull, fishing areas and depths, the potential for negative interaction between fishing boats and subsea architecture, and consequences ranging from cost implications of damaged subsea infrastructure, to capsizes and loss of life, to environmental catastrophe. Feedback from these sessions is always positive with oil and gas delegates gaining a valuable insight into the Fishing Industry, while supporting a positive on-going relationship between the sectors.